If you have a thing for handloom outfits, have a look at these lovely Chanderi dress materials. This style originated in a town called Chanderi in Madhya Pradesh. It is made with three types of fabrics- pure silk, blended silk and Chanderi cotton. Chanderi dress materials have one thing in common - the designs feature traditional coins, peacocks, floral and geometric prints. You can wear the Chanderi kurta with a pair of leggings to get the Indo-fusion look. Team it up with a pair of earrings to complete the look. With summer coming closer, cotton dress materials are a must have in your wardrobe. There are so many reasons why you should opt for cotton dress materials. They are lightweight, breathable and easy to wear especially during summers. Cotton is the perfect fabric for casual outings with friends, family and so on. With the various sleeve styles and cuts, you can also wear cotton dress materials on special occasions. Besides the regular salwar, you can wear it with a Patiala salwar for a glamorous look. Cotton, as a fabric, makes you look a little plump and is perfect for skinny women. Similarly, crepe is a fabric that makes the wearer look slimmer as the fabric clings to your body. Hence if you want to look slimmer in a salwar kameez, go for crepe dress materials. They are comfortable and lightweight. What makes crepe a versatile fabric is its perfect fall which makes the wearer look graceful. Be it parties, formal events or daily wear, crepe is a fabric that can be worn just anywhere. However, you must not forget to accessorise. Who says dressing should be so organised? Mix and match prints and fabrics to experiment with your looks. These bright and colourful dual-top dress materials are pretty and budget friendly. 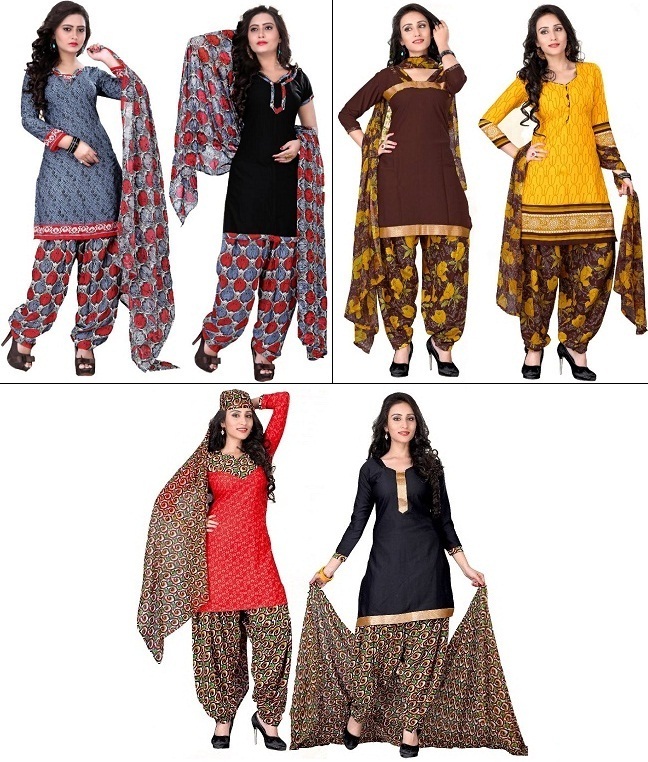 These dress material sets comprise of two kurta materials, one salwar material and a dupatta. Pick the colour according to the occasion and you are good to go. Do You Love Staying in Fashion Always? Stay Tuned for Regular Updates on Latest Trends!